When it comes to putters, you have three distinct groups: the it’s all about looks and feel crowd, the it’s Scotty (or Betti) or bust crowd, and the those fancy putters won’t make you putt better, plus they’re too damned expensive crowd. There’s a small – but growing – fourth crowd: the I get the face whole technology thing, give me more of that crowd. 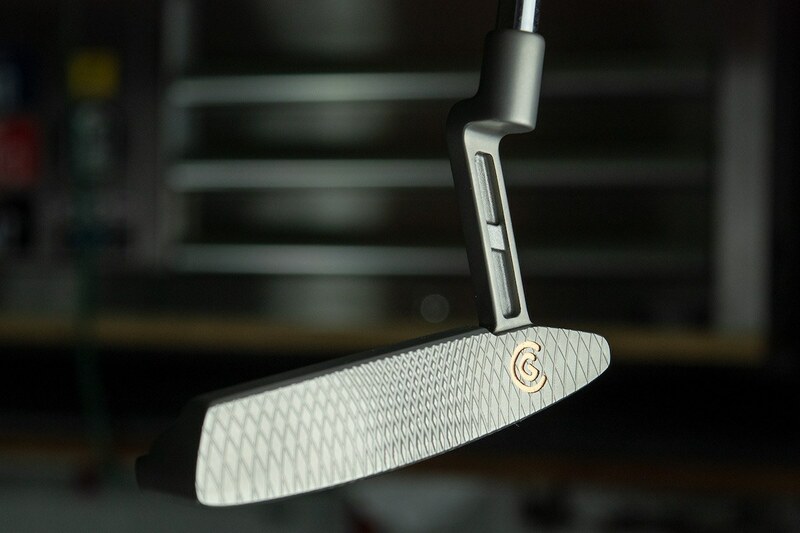 If you’re a member of groups 3 or 4, Cleveland Golf’s recent release of the Huntington Beach SOFT putter line might just make you want to Twist and Shout like Ferris Bueller. If you’re a proud, card-carrying member of groups 1 or 2, well, ignore technology at your own peril, and if the SOFT line isn’t expensive enough for you, well, Cleveland is sorry. For Cleveland, that segment is the $99-to-$159 value/performance putter market. The original Huntington Beach line ($99) and the higher tech TFI 2135 Satin line ($149-$159) both feature milled 304 Stainless Steel faces, solid performance, and excellent value. The new Huntington Beach SOFT line is basically a cross between the two. In Cleveland-speak, SOFT stands for Speed Optimized Face Technology – a unique, model-specific milling pattern designed to preserve ball speed on slightly off-center hits. It’s Cleveland’s version of what both PING and Evnroll do – use putter face technology to help make sure you get the ball to the hole when you don’t hit it dead center. This is the same face milling idea Cleveland uses in its TFI 2135 series. In a nutshell, at the sweet spot, you have more groove and less face. As you move away from the sweet spot, you have more face and less groove. As with the TFI 2135 series, each putter head in the Huntington Beach SOFT line will feature unique face milling, based on those MOI and CG properties. The milling pattern on the #11, for example, is different than the milling pattern on the #6, which is different than the milling pattern on the #1. 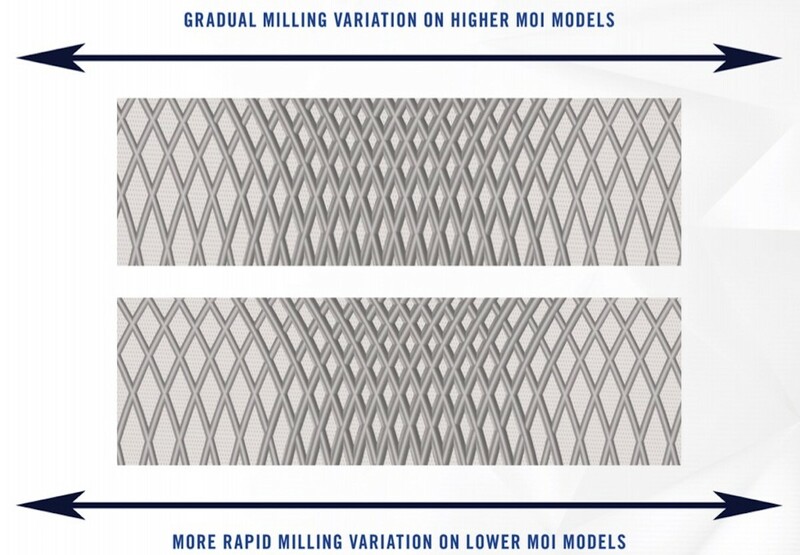 The higher MOI models – specifically the mallets – feature a more gradual milling, while the lower MOI blades have a more aggressive pattern. Provided your read is correct, does face technology help you get the ball closer to the hole on mishits? It’s something MyGolfSpy has proven repeatedly over the years, but there’s still the notion that looks and feel are the most important – if not the only – attributes that matter in a putter. Oakley, for his part, sees it both ways. Heel or toe hits with a slow-moving putter head are relative. We’re talking a few millimeters, not a few inches. The SOFT line features six models, all slight variations on existing Huntington Beach or TFI models. The #11 is Cleveland’s take on the popular fang-toothed Odyssey #7, a putter head nearly every OEM, putter specialist, and boutique outfit offers. It’s usually a toe-hang model with high MOI, but the center shaft basically balances the face. Other variations: the SOFT #12 is a full mallet head, essentially the same as the TFI 2135 Cerro but without the 2135 alignment aid, while the SOFT #8.5 is a wider blade similar to the Huntington Beach #8, with just a hint of a backside curve. One obvious question: does the introduction of the Huntington Beach SOFT line mean the end of the standard Huntington Beach line? Oakley says Cleveland isn’t really sure yet. Oakley says there are no plans to add head shapes to the SOFT line, but it’s hard to believe it’s something Cleveland won’t consider doing. One reason Cleveland may want to phase out the original Huntington Beach line is price – those things are a bargain at $99 and may be troublesome competition for the SOFT line, which goes for $129.99. The extra 30 bucks does get you the updated face technology (which isn’t insubstantial), a nicer paint job (more on that later) and an oversized grip standard (you can custom order a pistol grip if you want). Also, you can custom order for length, loft and lie on Cleveland’s website at no extra charge. And if you want to spend another $10 bucks, you can jazz up your putter even more with a customized paint job. The Cleveland website lets you customize the paint fill in four different areas (the face logo on the heel, the Cleveland logo on the back, the alignment line and lines/branding on the sole), with 16 different color options. 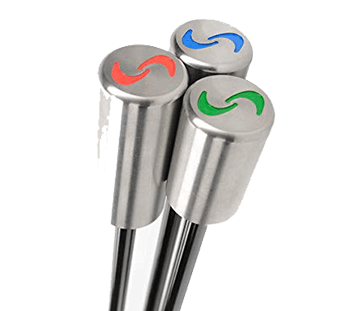 If you like a dash of color in your putter, it may very well be the best $10 value in golf. 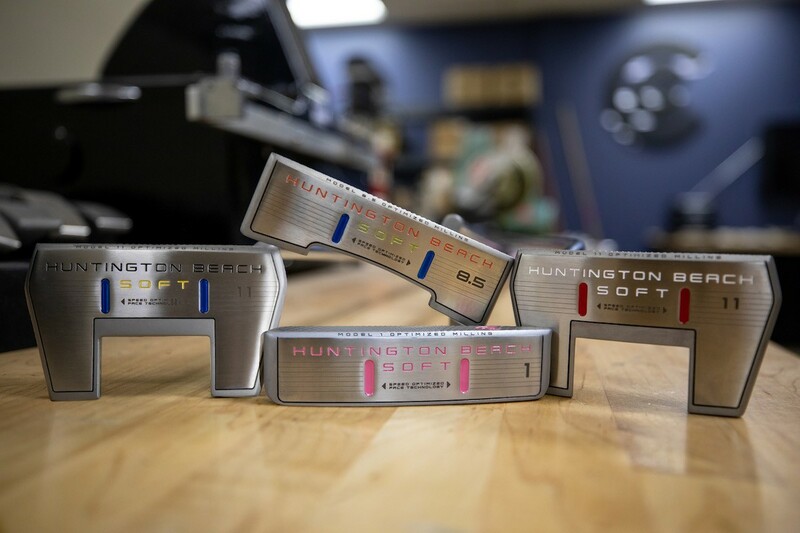 For right now, the color personalization option is exclusive to the Huntington Beach SOFT line, but Oakley says if it goes well Cleveland may consider expanding it into the other putter lines. 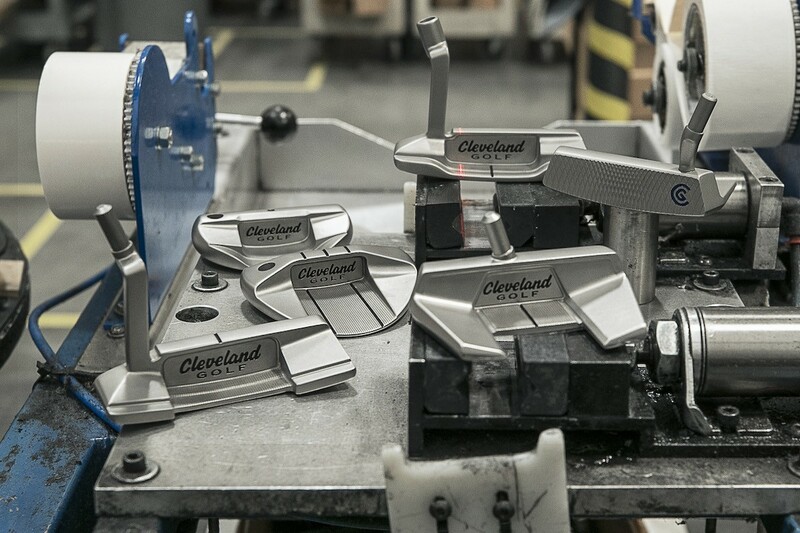 Cleveland’s stance is that any of its putters will perform just as well as your Scotty, your Edel, your Bettinardi or any big-dollar boutique brand you can name, and do it at a fraction of the cost. If you’re in sales and marketing, that’s both a blessing and curse. Just how much of performance difference is there between a mass-produced, Chinese-made 304 stainless steel milled head and a custom-machined, 303 stainless steel head made in the U.S. by Scotty or Bettinardi is an open question. The other open question is will you, as a consumer, actually believe the less expensive putter performs similarly enough to actually buy it? 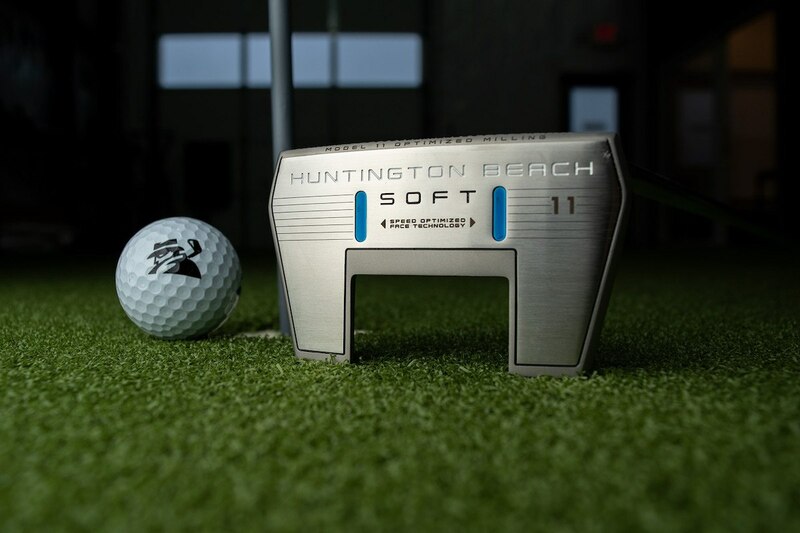 As mentioned earlier, the Huntington Beach SOFT putter line sells for $129.99 and is available now at retail and on clevelandgolf.com. The $10 personalized paint fill option is only available online. After 3 rounds, I must admit, the HBSoft does what they advertised…..Heel & Toe putts same distance as center putts. ……and for under $100! So the TFI technology must’ve just been hype? Why not blend the ‘SOFT’ technology with the TFI technology? Guessing it has to do with selling two different technologies and attracting more overall customers?!? 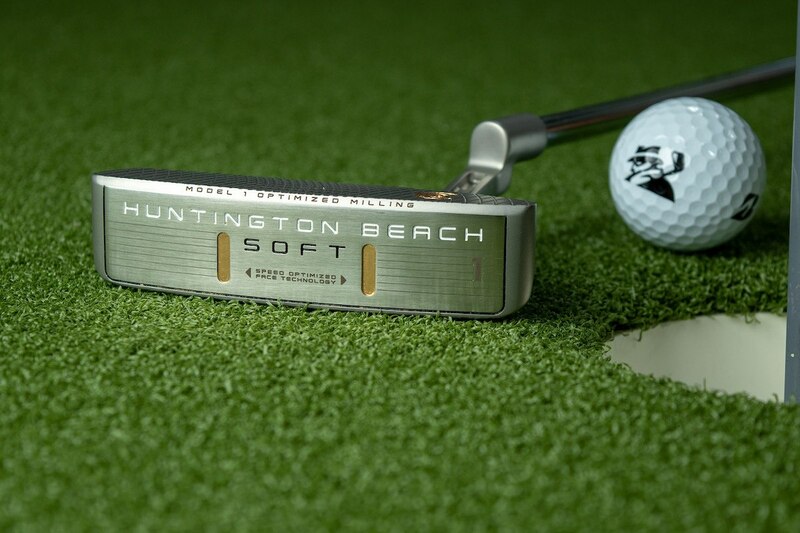 This new putter lineup is adding the SOFT technology to the Huntington Beach line. I have been wanting to try a center shafted putter for a while, but havent been able to find one at my local course. At these prices, i may just have to take a chance. There will always be golfers who put status above performance. 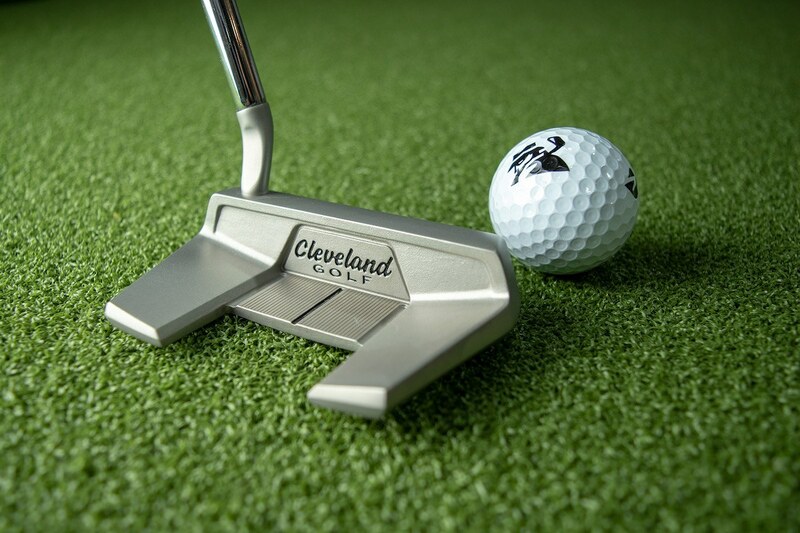 Cleveland produces a great putter at a very reasonable cost. If you spend enough practice time with one of these new offerings I would bet you wouldn’t see any difference between these putters and your current gamers. Good weight distribution, MOI’s and face milling make Cleveland a very good choice. If I wasn’t totally pleased with my older Ping Redwood I would definitely give one of these a good try. Thank you Cleveland for putting performance first and price at a lower priority. Oakley, since a couple of the putter heads seem to be symetric, and you appear to be using a shaft adapter rather than bent shafts for some models, will you be offering left-hand versions of the #6, 11, 11C, and 12 models? So there is no patent on groove patterns. Based on your evnroll tests you would think every putter manufacturer would have one of these in their range. Plenty of patents on grooves. Which is why you see them all trying to accomplish a similar goal in different ways. I love Cleveland products, not for the reasonable costs although it certainly helps, but for the quality that is built into their gear. I’d give these a try and I’ll bet it performs just as well as the more expensive “name” brands. Most putters in standard lengths (33 – 36″) have lie angles or 71-74 degrees. The old long putters lengths (44 – 48″) had a lie angle around 78 degrees. If you go with a really short putter (mine is 31″, and I’m 5’9″), so I need less lie angle to get the putter center line under or slightly inside my eye line; around 70 degrees seems to work. I’ve tried Huntington Beach previous offering, Evnroll, Bettinardi, and Odyssey, but when I tried a Scotty Cameron, there was something definitely different about the way the putter head interacted with the ball. I did notice that the length of the putter head (heel to toe) was slightly larger than everyone else’s so I’m not sure if this is what contributed to that “feel” difference… but it’s there and I feel it and it does make a difference in my putting stats. I still have these other putters and they are fine products. Every once in a while I’ll pull one out and perform a little putter competition and the Scotty always seems to get me closer to the hole. I’ve even pulled the Scotty and put the Evnroll (#1) back in the bag for a month and saw a distinct drop in my putting stats. Maybe it’s just me, but I feel the Scotty is worth every penny they charge for it. Right now you might get an argument from Jordan Spieth! His putting collapse over the past year shows once again (for the zillionth time?) that brands and prices don’t have much effect. Besides the physical measures of the putter, and the various face millings, inserts, etc., there is also the material of the putter / insert. 1020 carbon steel putters (without insert) would be softer than a 17-4 stainless steel, and other stainless steel formulations are somewhere in the middle. Putters with inserts will generally have a softer feel than any of the steel formulations. and you could have a steel insert backed by a plastic or other material to make the putter feel softer. Try this….put a single layer of duct tape on the face of one of your putters, and notice the change in feel….a bit softer. This could be a GAME-CHANGER for Cleveland. I would like to see the #12 also offered with slight toe hang. I’m an Engineer, fo if Cleveland is already going to offer options on loft and lie, it would seem to be very easy to bore the #12 shaft mounting hole 1/8″ closer to the heel, to give the toe hang. and on a couple of the other models, you could move the shaft hole further to the heel to satisfy those with a large arc and needing significant toe hang. Would be glad to test a #12 with slight toe hang…Oakley, eMail me for shipping address. This Putter stuff is getting, or I should IS ridiculous. In the past we never had to have a cover on the Putter and the first big ones were forged and of course the heads got marked up and dented from the clubs in the bag. Putters like the 8802 and Bullseye were the most popular before the Ping came along. The answer had a wave face but all of them putted great, and some still use them. Then along came the putters that had to have perfectly flat faces and were milled for that, no marks on the face at all were acceptable. Now they all have to nicks and crannies all over the face. So what is the deal other than they get more and more expensive with every change. Todays Putters cost more than my first set of Pro clubs including a Leather Bag. Well, I guess that is how big business is, keep changing and upping the price. In the end does it matter. Yes they cost more. So does everything else compared to 40 years ago. (I get your point though 👍). Cars used to cost 4K brand new in the 70s. Technology has improved. Putters have improved and especially for the average golfer who is well past a 10 handicap. Never understood guys who would spend 400 bucks and 10 bucks on a putter. Does anyone else feel like it is ridiculous that putting companies completely ignore large arc strokes? Not a single putter in this line up has a toe hang more than moderate. Mygolfspy’s own results show most people have large arc strokes and from my findings, it is the least offered putter by any company. Completely agree. The #3 is a great putter for putting on a pronounced arc. Cleveland seems to have dropped the toe hang from this lineup. I can appreciate that Cleveland knows who their target customer is with this line. There are many more golfers willing to pay $129 than $400+, and the face milling and personalization are a bonus at this price point. I like clean looking heads, not red or black, and all six look great! I would spend the $10 to personalize and order a #11, 36″ length with a pistol 2.0 grip. Soft #11, with red paint fill. Thank you. Got a chance to hit these side by side with the HB collection. The center shaft model is quite heavy and felt hard. All other models were quite softer than the HB models. Would def play the #1 SOFT. But…. my trusty rusty Newport 2 will be buried with me. 2 years ago I picked purchased the HB #3. Really liked it but it didn’t quite suite my swing. Last year I picked up the #11 and absolutely love it. If there were a golf club set that was made up of all of the best values in golf, these would be the bag’s flat stick hands down. What’s funny.. but not so much is that when I bought the #11, I remember thinking that maybe I should hold off because they’re probably gonna blend the face tech from the TFI with the classic look of the HB’s at some point.. and they did.. Damn you Cleveland! At least I don’t have to sell a kidney to buy another one. Great write up John. These look great. I wish the Cleveland website was this informative. Thanks for the write up, John. My Pro Shop just put an 11 and 11 Soft in the bin at $100. Seeing as I have have some substantial Christmas/Birthday Gift cards yet to be spent, I just may pick one up this week. loved the tfi 2135 feel and face tech but couldn’t get over how fugly the sight line was. this is a no brainer for me, i am finally going to splurge and buy myself an early x-mas present – thank you cleveland for making golf affordable. Nice! A second model available for lefties! As a very happy owner of the original Huntington Beach Blade putter, seeing the fang model available makes me think that I will need a change! Price will make that a not so naughty thing to do. 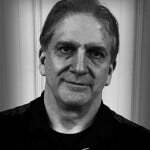 Nice Write up John! I like the alignment on the 12, very similar to one i have on my wide body blade, and i dig the notch back on the 8.5. Love the overall simple and clean design and how they’re incorporating the variable faces like Evnroll . I’m really digging what Cleveland is doing these days. Give me the #11 Center Shaft model and I will be as happy as a pig in a mud bath………. with a similar tech as that of the EVNroll that speeds up the putts from the toe and heel putts (we are talking about a few mm off line here) and good speed off center line putts, balancing the putter head with a center shaft just makes good sense…….. if you can’t putt straight after all that…….. take up tiddly winks……. safer option!!! I was planning on an Evnroll for next year. May well go that way. 3 footer’s were killing me this year (yes it’s me not the putter). But the Cleveland’s were already on the test list. And these look fantastic. $10 to dress it up? Gotta like that.